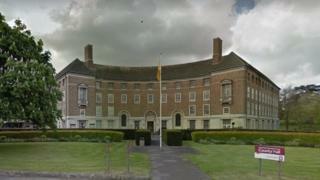 A council has unveiled plans to lose up to 130 jobs and cut major services so it can balance its books. Somerset County Council has announced cutbacks to highways, public transport and special needs services. Staff will also be told to take two days unpaid leave for the next two years. The authority needed to save £19.5m in 2017/18, but only made cuts of £11.1m. Its chief executive said he had been left with "no choice" due to reduced funding from central government. Leader of the Conservative-run council David Fothergill said the authority had now reached the "very sharp end" of continued austerity. "Local authorities have to deliver a balanced budget. We cannot overspend and be bailed out later - we have to live within our means," he said. "We've tried hard to avoid this, looked at every option open to us in terms of financial flexibility, but have been left with no choice. "This is the very sharp end of austerity, but the consequences of not taking this action, of not bringing ourselves to financial sustainability, would be even harder on our residents and that has to be avoided." The plans are due to be voted on by councillors at a cabinet meeting next week. A spokesman said if agreed it would save about £13m over the rest of this financial year, and £15m in 2019/20.